Bateman, Charles T.R. J. Campbell, M. A. Pastor of the City Temple, London. London: S. W. Partridge, 1903. Bradstock, Andrew. “‘A Man of God is a Manly Man’: Spurgeon, Luther and ‘Holy Boldness.’” Masculinity and Spirituality in Victorian Culture. Ed. Bradstock, Andrew, Gill, Sean, Hogan, Anne, and Morgan, Sue. Basingstoke: Palgrave, 2000. 209–25. “Business Announcements.” North Wales Chronicle. 28 Aug. 1880. Buzard, James. Disorienting Fiction: The Autoethnographic Work of Nineteenth-Century British Novels. Princeton: Princeton UP, 2005. Byrd, Max. London Transformed: Images of the City in the Eighteenth Century. London: Yale UP, 1978. “A Clerical ‘Casual’ Reviewed.” Western Mail 15 Feb. 1875. Davies, Charles M.The Great Secret and its Unfolding in Occultism: A Record of Forty Years’ Experience in the Modern Mystery, by a Church of England Clergyman. London: George Redway, 1895. Davies, Charles M.Heterodox London, or Phases of Freethought in the Metropolis, two volumes in one, 1874. rpt. New York: Augustus Kelley, 1969. Davies, Charles M.Mystic London: Or, Phases of Occult Life in the Metropolis. London: Tinsley Brothers, 1875. 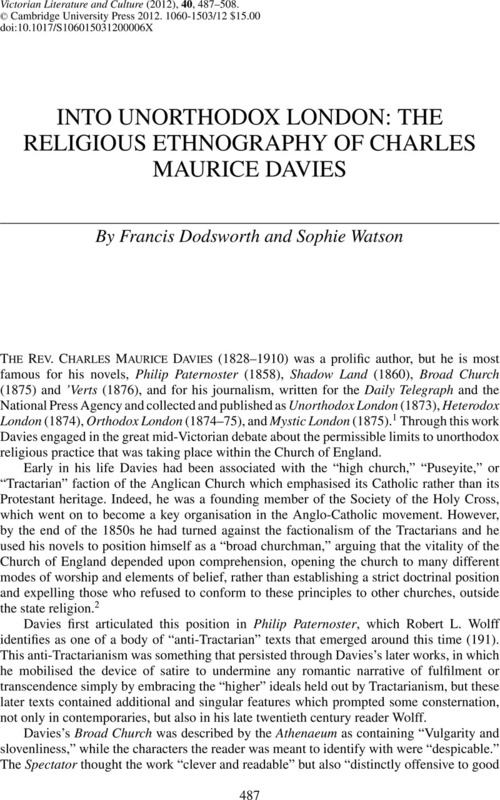 Davies, Charles M.Orthodox London or Phases of Religious Life in the Church of England. New Ed. Rev. London: Tinsley Brothers, 1876. Davies, Charles M.Religious Differences: A Sermon Preached at St John the Baptist's, Great Marlborough Street, And Afterwards Read as a Paper before the London Dialectical Society. Kensington: James Wakeham . Davies, Charles M.Unorthodox London, or Phases in the Religious Life in the Metropolis. 3rd ed.London: Tinsley Brothers, 1875. Englander, David, and O'Day, Rosemary, eds. Retrieved Riches: Social Investigation in Britain, 1840–1914. Aldershot: Scholar, 1995. Etherington, Norman, ed. Missions and Empire. Oxford: Oxford UP, 2005. Hall, Catherine. Civilising Subjects: Metropole and Colony in the English Imagination, 1830–1867. Cambridge: Polity, 2002. Hempton, David. Methodism and Politics in British Society, 1750–1850. Stanford: Stanford UP, 1984. Herbert, Christopher. Culture and Anomie: Ethnographic Imagination in the Nineteenth Century. London: Chicago UP, 1991. Rev. “Heterodox London.” Pall Mall Gazette. 26 June 1874. Hogan, Anne, and Bradstock, Andrew, eds. Women of Faith in Victorian Culture: Reassessing the Angel in the House. Basingstoke: Palgrave, 1998. “Latest Intelligence.” Hampshire Telegraph and Sussex Chronicle. 28 May 1881. Martin, David. A Sociology of English Religion. London: SCM, 1967. McLeod, Hugh. Piety and Poverty: Working Class Religion in Berlin, London and New York, 1870–1914. New York: Holmes and Meier, 1995. McLeod, Hugh. “Varieties of Victorian Belief.” Journal of Modern History 64 (1992): 321–37. “Mystic London.” Pall Mall Gazette. 12 Feb. 1875. Nash, David. “Secularism in the City: Geographies of Dissidence and the Importance of Radical Culture in the Metropolis.” London Politics, 1760–1914. Ed. Cragoe, Matthew and Taylor, Antony. Basingstoke: Palgrave Macmillan, 2005. 97–120. Nord, Deborah E. “The City as Theatre: From Georgian to Early Victorian London.” Victorian Studies 31 (1988): 159–88. Nord, Deborah E.. “The Social Explorer as Anthropologist: Victorian Travellers among the Urban Poor.” Visions of the Modern City: Essays in History, Art, and Literature. Ed. Sharp, William and Wallock, Leonard. London: Johns Hopkins, 1987. 122–34. “Obituary: The Rev. Dr. C. M. Davies.” The Times. 9 Sept. 1910. Oldstone-Moore, Christopher. “The Beard Movement in Victorian Britain.” Victorian Studies 48 (2005): 7–34. Oppenheim, Janet. The Other World: Spiritualism and Psychical Research in England, 1850–1914. Cambridge: Cambridge UP, 1985. Rev. “Orthodox London.” Pall Mall Gazette. 15 Nov. 1873. Pike, Godfrey H.The Metropolitan Tabernacle. London: Passmore & Alabaster, 1870. Poovey, Mary. Making a Social Body: British Cultural Formation, 1830–1864. London: U of Chicago P, 1995. Ratcliff, Samuel K.The Story of South Place. London: Watts, 1955. Royle, Edward. Radicals, Secularists and Republicans: Popular Freethought in Britain, 1866–1915. Manchester: Manchester UP, 1980. Smith, Warren S.The London Heretics, 1870–1914. London: Constable, 1967. Spurgeon, Charles H.The Metropolitan Tabernacle: Its History and Work. London: Passmore and Alabaster, 1876. Rev. “Unorthodox London.” Pall Mall Gazette. 1 May 1873. Valenze, Deborah. Prophetic Sons and Daughters: Female Preaching and Popular Religion in Industrial England. Princeton: Princeton UP, 1985. Vicinus, Martha. Independent Women: Work and Community for Single Women, 1850–1920. London: U of Chicago P, 1985. Walkowitz, Judith R. City of Dreadful Delight: Narratives of Sexual Danger in Late Victorian London. London: Virago, 1992. Wheeler-Barclay, Marjorie. “Victorian Evangelicalism and the Sociology of Religion.” Journal of the History of Ideas 54 (1993): 59–78. White, Hayden. The Content of the Form: Narrative Discourse and Historical Representation. London: Johns Hopkins UP, 1987. White, Hayden. Tropics of Discourse: Essays in Cultural Criticism. London: Johns Hopkins UP, 1978. Williams, Sarah C. “The Language of Belief: An Alternative Agenda for the Study of Victorian Working Class Religion.” Journal of Victorian Culture 1 (1996): 303–17. Williams, Sarah C.. “Victorian Religion: A Matter of Class or Culture?” Nineteenth Century Studies 17 (2003): 13–17. Wolff, Robert L. Gains and Losses: Novels of Faith and Doubt in Victorian England. London: Garland, 1977. Woods, G. S., and Banerji, Rev. N.. “Davies, Charles Maurice.” Oxford Dictionary of National Biography. 2004. Web. 23 Jan. 2012.